Hello there, I am delighted to be taking part in the Newton's Nook Designs Deck the Halls with Inky Paws Blog Hop today. You should have arrived here from the fabulous Yoonsun, but if you get lost along the way, I have the full list of participants below. I started off by die cutting three tags from Lana paper (similar to Yupo). I then cut another six from white cardstock. Taking three of them, I die cut snowy hills for my mice to sit on. I took the three tags from Lana paper and added drops of Copic Various Ink (the refills) on to them. I added a little Alcohol Ink Blending Solution and then using a marker spritzer, moved the ink around by pushing air on to them. These pieces were then set aside to dry. I took three of the mice from the Naughty or Mice set and stamped these on to white cardstock using Memento Tuxedo Black Ink. They were then coloured using Copic Markers (colours used listed below). I then die cut them using the coordinating dies. To add interest, I used a white gel pen to add details to the mice, as well as clear Wink of Stella for some added sparkle. I took two of the sentiments from the set and stamped these on to black cardstock using Versamark Ink. I applied white embossing powder and heat set. These were then cut in to strips. To assemble the tags, I took the alcohol inked pieces and added these to the white cardstock tags (for extra stability). I then added the snow banks on top with tape runner. The mice and sentiment pieces were added with foam tape. To finish off, I added a few Sparkling Clear sequins. COPIC MARKER REFILLS: Blue Tag - B04, B00, B0000. Purple Tag - BV11, BV000. Pink/Red Tag - R83, R81, R20, V000. COPIC MARKERS: Mice - N5, N3, N2, N1, N0, R00, R000. Blue Tag - B04, B02, B01, B00, B000. BG23, BG11, BG10. Purple Tag - BV13, BV11, BV01, BV000, V15, V12, V000. Pink/Red Tag - R37, R83, R81, R20, E59, E57, E55. Newton's Nook Designs will be choosing two lucky winners to win $20 store credit for Newton's Nook Designs online shop! To enter, just leave a comment on all of the blogs participating in the hop. Two winners will be chosen at random from the collective blogs in the hop. The more you comment, the better the chances of winning! You have until Sunday, December 10th at 9pm EST to comment. The winners will be announced on the NND blog on Monday, December 11th. 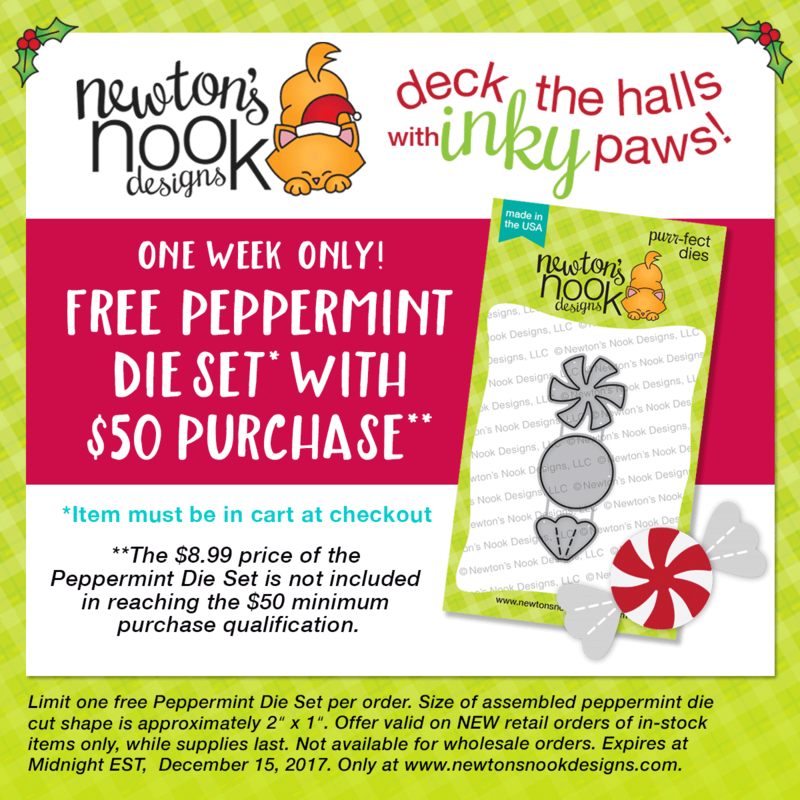 Newton's Nook Designs is also releasing a new exclusive Peppermint Die Set today. 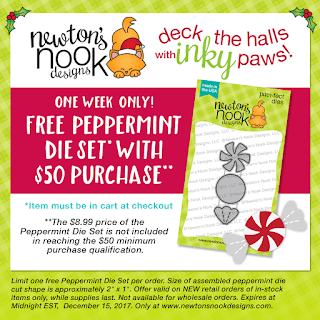 This fun new die set will only be available in the Newton's Nook Designs shop and you can get it for free this week with a $50 purchase. Offer is valid until Friday, December 15th, or while supplies last. The new die set is also available to purchase for $8.99. The next person on the hop is the amazing Nina-Marie Trapani. Thank you so much for visiting me today. I hope you have a great time on the rest of the hop and have a fabulous day! Love love love tone on tone look!!!! These tags are just fantastic!!! These tags are super cute! 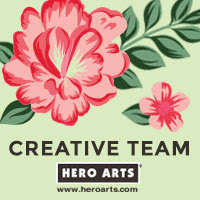 I love the way you created different watercolored backgrounds for them! So soft and pretty! Thank you so much for being part of our Deck the Halls with Inky Paws blog hop!! I love these tags! The colors, the blue, pink, and purple really look unique and beautiful! Inspiring! Darling tags! Love those adorable mice! Makes me want to make an investment in alcohol inks. Lovely backgrounds. Awww, These tags are so Xmas sweet! Thank you for sharing! Your mice are so adorable. Perfect for tags. Nicely done. Brilliant tags...utterly adorable. Have to get that stamp set! Cheers. EEEEEK! Your little mice are so stinkin' cute! The background on each tag is gorgeous too!!! 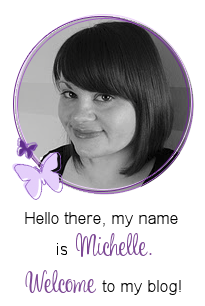 Michelle, your tags are FABulous! 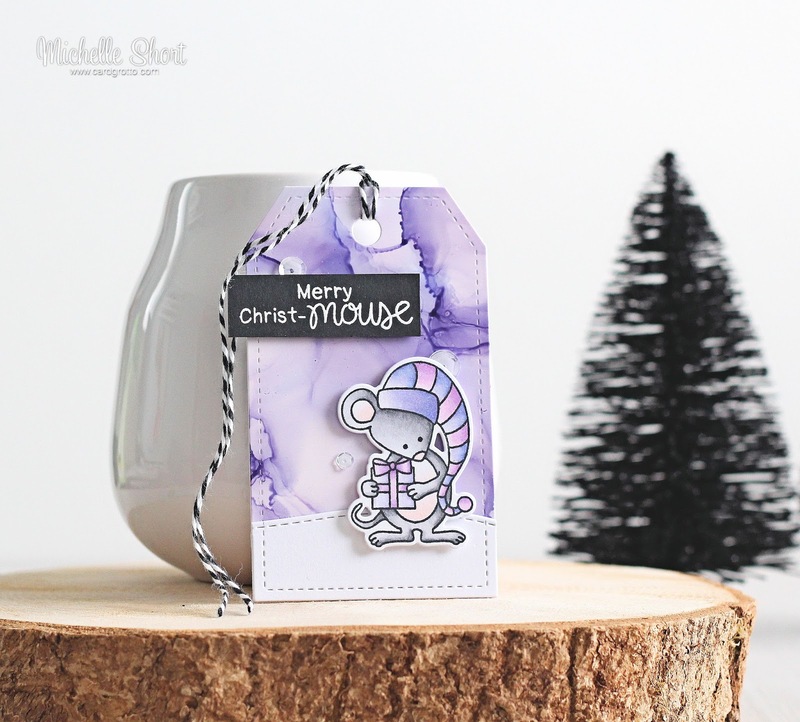 Cute and colorful mice tags. Oh my goodness! The mice tags are darling. Awesome work. I love these little mice! Magnificent tags, te background looks so pretty. These are adorable in every single color! Just so awesome! Glad you joined in the Inky Paws fun with us this week. Thanks for the inspiration! Such cute tags, love these little mice! What great background for your monochromatic tags with the sweet mice! What a great idea to use the same copic colors for the background and the mice! My favorite is the purple one, because it looks just like a purple veined marble. And those long stocking caps crack me up. No tiny hats for our mice! Thanks for sharing your beautiful ideas. love your soft backgrounds for the tags and the little images! These are all so adorable. I love the purple one. These tags are SO cute!! I love the sweet mice on those beautiful backgrounds! Fantastic tags! I love the colours on all of them! Beautiful effects achieved on the cards. Thanks for sharing your techniques. Love your tags with the cute mice. You did a beautiful job on the coloring! Thanks for sharing..